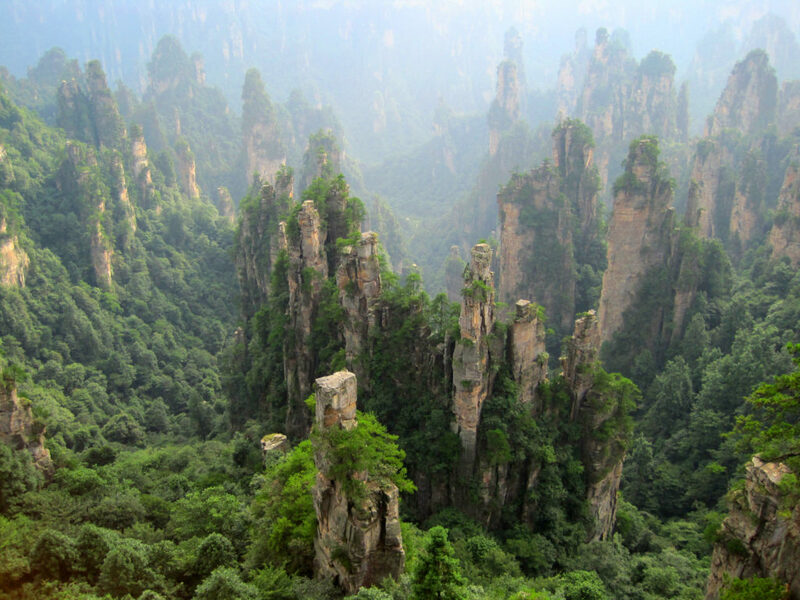 Zhangjiajie National Forest Park did not jump into people’s eyes until 2009 when the Hollywood movie Avatar was released. The Forest Park houses thousands of Avatar mountains. The Forest Park was recognized as a World UNESCO Heritage Site early in 1992, and then listed as a UNESCO global geopark in 2004. 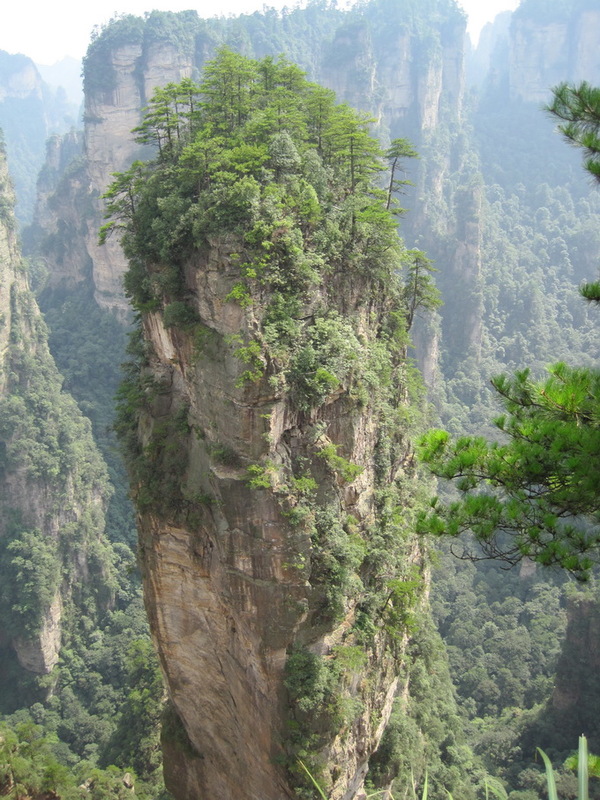 The Forest Park captures travelers with its unique pillar-like peaks like the famous floating Hallelujah Mountains in the movie. Thanks to the scenic hiking trails and amazing views, Zhangjiajie National Forest Park is now on many nature lovers’ bucket lists and is one of the top destinations in 2018 and 2019 for China tours. This guide helps plan a hassle-free adventure to the stunning geo park. The view of the mountain varies by season. Generally speaking, the best time to visit the Forest Park is from March to end of October – covering Spring, Summer and Autumn when the weather is comfortable and scenery is breathtaking. Is it that cold people cannot go visit? No, not at all. Wintertime, which falls from November to March, is usually less crowded as it is the offseason for traveling in Zhangjiajie. However, the Forest Park looks spectacular after a good snow. For adventurers, you will find no better time to discover the Park and get immersed in the mystic wonderland while it is quiet and beautiful. It seems views in all seasons are worth a go. Yes, it indeed is. But there is one exception, the National Holiday period in China – which goes from Oct 1st to Oct 7th every year. 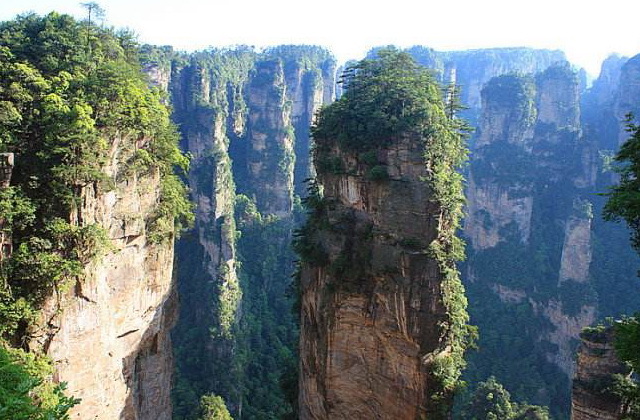 This is when you are strongly suggested NOT to visit Zhangjiajie. Tianzi means Son of Heaven. The Mountain was named after a minority leader who led a revolution around 900 years ago. What amazes travelers here is the various grotesque peaks. Each one has a story behind, which is quite typical in China as Chinese people love to combine imaginary legends with sceneries. The great part of this is it makes your hike more fun. You will take in the Yubi Peak (Imperial Brush Peak), Fairy Spreading Flowers Peak, Warrior Taming a Horse, and Devine Troops. The names of the peaks already make you curious enough and would like to go check them out, don’t they? 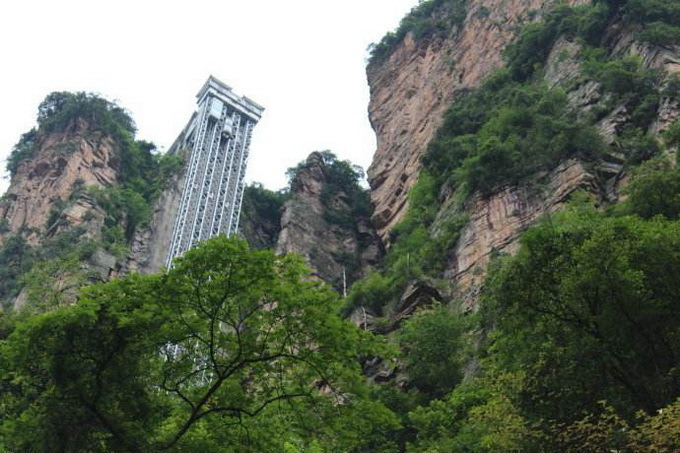 You may have seen many pictures of an outdoor elevator built on the peaks in Zhangjiajie, the Bailong Elevator, which takes travelers up to over 320m (1050ft) in less than 2 minutes. You will see it and experience it here in Yuanjiajie. Another stunning and well-known spot here is the famous Hallelujah Mountain, an independent and giant pillar rising abruptly from the valley. Do not forget to take a walk along the No. 1 Bridge under Heaven and you will better understand why Chinese gave such a big name to this natural bridge-like stone. A round trip train is available for travelers to admire the spectacular natural views in Ten Mile Gallery. Many find it great and energy-saving, especially after hiking after the previous two mountains. This is also where your imagination will be challenged. Figure out the famous peaks of the Old Man Picking Herbals, Peacock Showing its Tales, Couple Holding a Baby, Fairies Praying to Buddha, and a Roaring Tiger. It is unbelievable what nature presents here. For hikers, a single trip takes around half an hour. Taking a one-way small train and walking out of the scenic area is also a popular choice. The Golden Whip Stream is one of the best hiking routes with the most amazing views. One-way trip is around 7.5km (4.7mi) and needs around 2.5 to 3 hours to finish. Well, I would say it is worth every single minute of your hike. 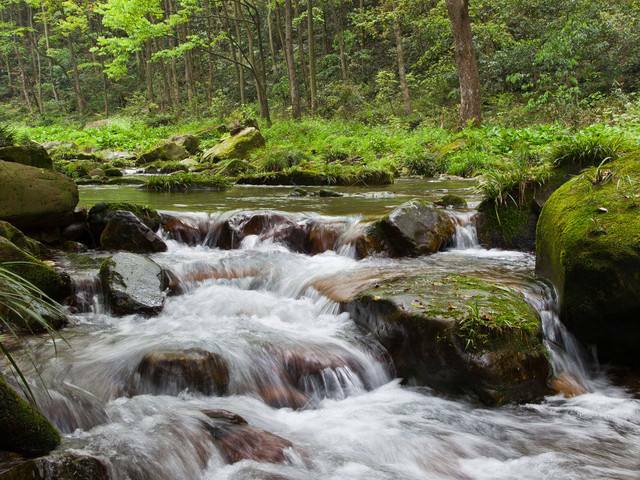 The murmuring stream is all along the hiking route with clear spring water, verdant forests, various wild flowers, and singing birds. Be careful of the naughty monkeys here that are always ready to rob travelers’ food. What’s especially wonderful here is the fresh air. It is said that there are above 100 thousand negative ions in a cube meter of air. Yes, grab the chance and breathe as hard as you can. Don’t worry if it rains. 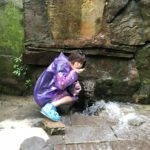 You will get incredibly amazing scenery during rainy days here with thin fog floating over the murmuring stream all the way down along your hike. 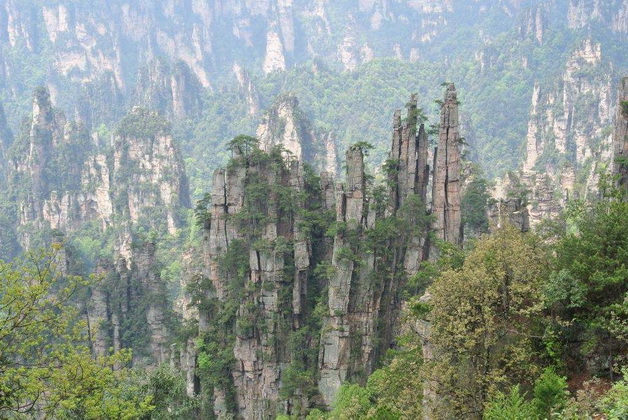 Yellow Stone Village has amazing hiking trails with unique scenery of grotesque peaks in Zhangjiajie National Forest Park. There are two options for the hiking, the small ring trail and the big ring trail. A cable car will get you to the mountain top to start your hike – which saves a lot of energy. 1 hour is needed to hiking the small ring trail while 2 are needed for the big ring. The big ring trail enjoys more enchanting views, while the small ring is less energy-consuming. Usually, a 2 full day trip will cover the essential highlights recommended above. But if you would like to also visit the famous Tianmen Mountain and challenge the thrilling Skywalk and the Glass Bridge over the Grand Canyon, another full day is needed. The shuttle bus in the Park is the main transportation for travelers to move from one spot to another. 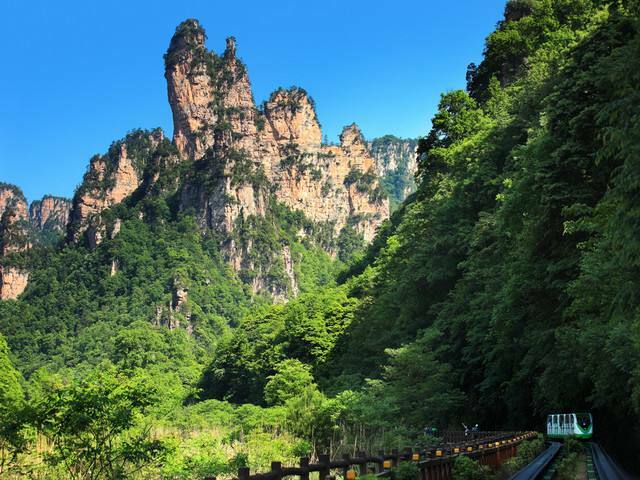 Facilities like cable cars and elevators are built in Zhangjiajie National Forest Park to help travelers hike in the magnificent sceneries. Once you arrive at the entrance (The Park has separate 5 entrances in total and the guide below which is the closest to the attractions on the day), take this route to best experience the breathtaking sceneries. Day 1: Entrance (Biaozhi Gate) -Shuttle Bus-Yuanjiajie-Bailong – Elevator Up-Hike in Yuanjiajie – Scenic Area-Shuttle Bus to Tianzi Mountain-Hike – Cable Car Down – Shuttle Bus-Ten Mile Gallery-Round Trip Small Train (Or hike one way and take small train to come back) – Shuttle Bus-Back to Entrance. Day 2: Entrance (Forest Park Gate)-Cable Car up Hike in Yellow Stone Village -Cable Car Down-Hike along Golden Whip Stream to Shuiraosimen Gate. The Forest Park is located in Wulingyuan Scenic Area. When you arrive in Zhangjiajie, you could take a bus at Central Bus Station, which will take around 1 hour at the cost of RMB12 ($2 USD). Alternatively, you could take a taxi which takes 40 minutes. Please note: Take a taxi that uses a meter (meaning it is a legal taxi). Otherwise, negotiate the price before you go and pay after you arrive. 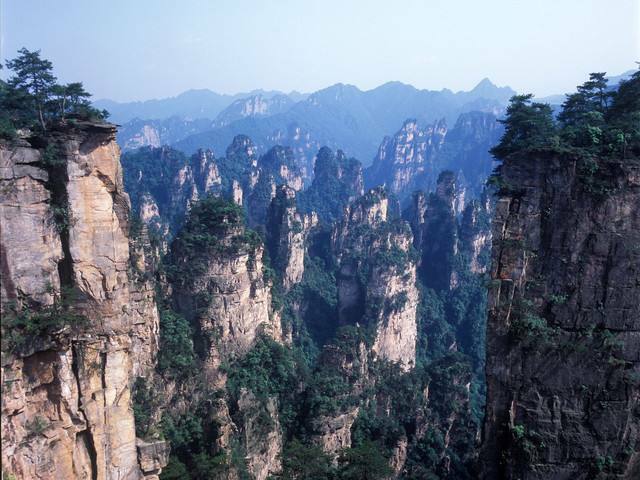 The ticket of Zhangjiajie National Forest Park is valid within 4 days upon purchase. It is also because the Park is large and nature fans could stay longer and discover more. As the Forest Park is in Wulingyuan Area, accommodation in Wulingyuan is recommended. There are branded international hotels like Pullman and Crown Plaza. However, there are also some local Chinese hotel brands with good facilities and services. There are also many hostels if you are a budget traveler. So, if you are a true adventurer and fascinated by the magnificent views of Zhangjiajie National Forest Park, get packed and go! Please keep in mind to get your cameras fully charged! Sarah is a frequent traveler. With a great passion for adventure, hiking, photography, food, and history, she has traveled to most parts of China, both the highlights and off-the-beaten-track wonders. She also writes for Elysian Tour to share her travel tips and ideas.